The word "privatization" has been part of the international lexicon since 1969, when management expert Peter Drucker used the term "reprivatization" in his book "The Age of Discontinuity." Robert Poole of the Reason Foundation, a Los Angeles-based research institute, was primarily responsible for popularizing the concept in the 1980s. There are varying degrees and types of privatization. In its most general sense, privatization involves an increased private-sector role in the management of government assets or the provision of government services. Examples include the sale of government assets to private owners; private management of government assets under a contract with a private asset manager; private management of government services and service employees; and private production of government-mandated services through contracts with private vendors. Outside of the United States, privatization has long meant the sale of state-owned enterprises, such as airlines, railroads or ports. Within the United States, such sales have been infrequent, since this country was never as deeply involved in owning and running industries as other countries were. Nevertheless, the U.S. government has sold a few of its assets, most notably the Elk Hills Naval Petroleum Reserve, which generated $3.65 billion in new revenue. The more common form of federal government privatization involves contracting with private firms for public services formerly provided by federal employees. Some of these services are significant. For instance, the Pentagon is employing contractors in the U.S. war in Iraq and may privatize the military mail system. The actual price for delivering military mail has been estimated at more than $1.8 billion annually, and a government task force concluded that contracting for this service could save 30 percent. Outside the Pentagon, the 2001 "President’s Management Agenda" requires competitive bidding between private vendors and certain public agencies for services ranging from printing to fisheries management. According to the Reason Foundation, 181 of these "competitions" between federal employees and private contractors took place in fiscal 2005. The competitions are expected to generate $3.1 billion in savings and cost avoidance over five to 10 years. Privatization at the state level is commonplace today, and the examples of privatization are as varied as the 50 states themselves. For example, Michigan sold its worker compensation insurance business for more than $255 million in June 1994 — the largest single state asset sale in the nation’s history at the time. In New Mexico, more than 43 percent of state prison inmates are housed under contract with a private management company, according to the U.S. Bureau of Justice Statistics. Privatization is also common in counties, townships, cities and villages. Some localities have sold off city-owned parking garages and golf courses or contracted the management of such services as refuse collection, wastewater treatment, building permit inspections and rodent control. New York City has contracted with a nonprofit organization to manage the world-famous Central Park. Another area of government that has gained a great deal of experience in competitive contracting — especially in New Jersey, Rhode Island and Michigan — is public education. 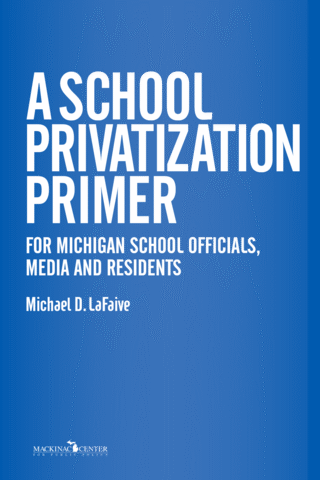 The privatization of major school support services — food, busing and janitorial — is the focus of this guide.